Fumio Fujita - One of Japan's most well-known contemporary sosaku hanga artists, Fumio Fujita studied at the Musashino College of Fine Arts and began creating woodblock prints in 1963. His subjects are nature based, and he is best known for his many images of trees, especially birch trees - a signature Fujita image. He simplifies and reduces forms to their elements, bordering on abstract, with an emphasis on pattern and texture. Fujita’s prints are all pencil signed and numbered, limited editions. His works have been included in the prestigious Collage Women's Association of Japan (CWAJ) exhibitions several times. Fujita’s works are becoming increasing collectable, especially some of his earlier designs. 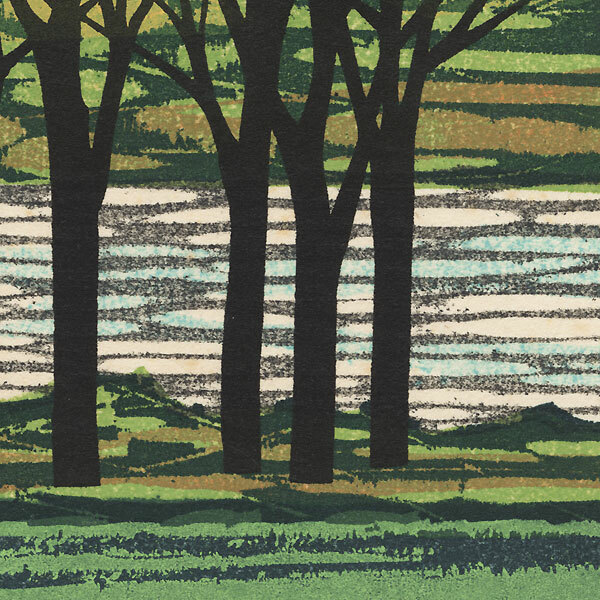 His lovely prints would make a wonderful addition to any modern woodblock collection. Condition - This print with excellent color and detail as shown. Slight toning and spotting. Please see photos for details.